Donate Life Float Rose Dedications - Last Chance!!! Four years ago I was given the honor of riding the Donate Life Float in the 2009 Rose Parade. That year, and every year since, I’ve been able to dedicate a rose on the float to Kari. Above is a picture of me placing my roses in 2009. This year, I have the privilege of dedicating two roses to two Iowa girls who loved one another – My donor, Kari, and her friend Alex. The ups and downs of life teach us many lessons, with those experienced through organ and tissue donation and transplantation being among the most profound. Donor families pass through grief on the way to peace and remembrance; living donors step forward to give love and life to others; and transplant recipients courageously move forward from harrowing illness to health and gratitude. Though our paths vary from the places we start, we are all connected on our Journeys of the Heart. Inspired by the 2013 Rose Parade® theme "Oh, the Places You'll Go!™," the tenth Donate Life Rose Parade float entry will transport 32 riders representing deceased organ, eye and tissue donors, living donors, and transplant recipients through a magical, heart-filled world encompassing the highs and lows that life has to offer. A pathway of looping hearts is lined with 72 memorial floragraph portraits of deceased donors who are remembered every step of the way. The float's collection of joyful hearts representing the new life made possible by transplantation is grounded by a reverent dedication garden filled with roses bearing personal messages honoring those who make the gift of life possible. The journey peaks with overlapping red and purple hearts representing the love and courage that define humanity at its best. In the pre-op waiting room, right before she was escorted to the OR waiting room, Alex told me that she named the gift she was giving me "Mabel". About three months later, I was doing a presentation for Iowa Donor Network and Alex left me a voice message - I still have it on my phone... At the end of her message, she said, "SOOooo, I guess there must be something special about Algona, Iowa, and the girls who come from there...". Yes - I guess there is... Alex was letting me know that University of Chicago had called her and let her know she was a good match... She just wanted to let me know, "You have a kidney!" Can you imagine what it feels like to have your life saved by an incredible, beautiful, thoughtful & compassionate girl - who allows you to breathe and live in a way you'd never imagined... Then, 12 years later, you find yourself in trouble again - and you have another incredible, beautiful, thoughtful & compassionate girl, who grew up with and loved Kari - reach out and save your life again?!?! I woke up the next morning and was still intubated, for precautionary purposes... Laura said I was rather anxious, trying to say something and no one understood - and finally, Laura said, "Alex is fine...", and I immediately calmed down... I then got a pen & paper and, in my propofol haze, wrote a note about how much I love Laura, Alex, Dr Becker & Dr Garrity and luckily then I ran out of paper... When they were about to extubate me - my lung transplant nurses, Penny & Pat, had stopped to visit, so they gloved up and helped... Right before they sent Laura out so they could pull the tube, she asked for another minute - to enjoy the silence - since there would no longer be any of that in a matter of seconds!!! In two days, my kidney function was normal... It probably hadn't been there in 20 years - years of cystic fibrosis meds had already compromised them before I got my beautiful lungs... Four days after I was opened up on the table - I walked to our local restaurant, Hackney's, and had a ham & cheese sandwich! The next day, Laura and I went on two 2-mile walks! I'm hoping that I'll soon qualify for honorary Iowa citizenship - because it does seem that I'm slowly being rebuilt into a girl from Iowa. My team wore purple & gold. I wore the shirt that Kari’s volleyball teammates wore – the shirt that Kari’s mom sent me… My docs made me step it down a notch and climb slowly because of the 10” gash in my belly from my Christmas adventure eight weeks earlier. Do you have any idea what it feels like to step out of the stairwells after climbing 94 floors to a whole mess of cheering people and a sea of purple?!?! This year, Kari’s family was here – her sister and cousin were in the stairwells with me… Her mom and Godmother were at the top, waiting for us… More than anything, I wish I could give Kari back to them – but I cannot… I think about her throughout the day, every day – but that doesn’t hold a candle to them thinking about her. One thing I can do, is to keep her alive in the hearts and minds of the people who loved her, and even some people who never knew her – and her mom and sister saw dozens of people come out to honor her with me, and keep Kari’s spirit, her smile and her memory alive. Yesterday was an amazing experience for me. Simply amazing. Picture this. I see these people standing around with Kari’s Klimbers shirts on and have no idea who they are. Didn’t recognize them from the previous years. I had totally forgotten about Steve telling me about the heart transplant recipient being with her donor’s family again, and her donor’s mom climbing with her for the first time this weekend. Well, here comes this beautiful, energetic, effervescent young gal emerging from the crowd with an unbelievable glow on her face and a shine in her eyes. She was radiant. She had a stethoscope around her neck, so I assumed she was a healthcare professional who was greeting her supporters. Someone that you had probably met in your journey through the healthcare system. After she hugged these three people, she took the stethoscope and put it in the ears of this one woman and held the other end to her heart. OMG, OMG, OMG. I realized what I was witnessing. This was the gal who had the heart transplant with the mother, father and aunt of the donor, who were listening to their loved one’s heart in this gal’s body. I have to tell you that it completely blew me away. Completely. The joy in the eyes of the Mom was something I’ve never seen before. I thought of my own Mother and how she would have felt if she had had the opportunity to hear my brother’s heart beat again after he passed. Thank you so very much for affording me this opportunity to witness this experience. Truly amazing. I immediately texted my nieces and one nephew who all know you two. They were blown away as well. I told my sister-in-law, Peggy, (the mother of the triplets who was with me through my surgery) that seeing this event between these people affected me as much, if not more, than the birth of her kids. I will never forget it. This is my tenth climb... When I come out of the stairwells at the top, and I do believe I will come out, I'll have climbed 16,320 steps for the Respiratory Health Association at this awesome event!!! The year started out rather crazily... On Christmas Eve I was in emergency surgery after a renegade gall stone the size of an angry, small dog (or mothball) tore through my gut... An incredible surgeon, who is scheduled to do my kidney transplant, removed my gall bladder, my appendix, 6" of my colon, put it back together, hosed me out and sent me on my way with an awesome 10" scar up the middle of my belly! A few weeks ago, she gave me permission to climb, sloooowly, and I promised I'd stop if my body says stop... And I will. And finally, and very important to me -- please consider organ & tissue donation, register to be a donor on your state's registry, and tell your family how you feel. I know a beautiful girl from Iowa who knew how she felt and she told her family -- I think about her every single day. I am a Bears fan. And though Green Bay has always been one of our biggest rivals – right now, I’m a Packer fan too… The gift they gave Anna will be with her forever. There is also a family out there somewhere who lost someone – and the heart of their loved one beats in Anna’s chest. You have the ability to allow someone to have the most amazing feeling in the world. Register to be an organ donor. Four people and their families are celebrating this holiday season… Whether those four people are celebrating Christmas, Hanukkah, Kwanzaa, Solstice or some other observance – I do not know… But I do know that they’re able to do so because of a beautiful, 16-year-old girl from Iowa named Erika. With Scott’s help – I’ve been yipping about Annie and the Chana family and their upcoming Rose Parade adventure – and now I’d like to tell you about a donor from Iowa being honored with a floragraph. Erika Desiree Schwager lit up the room with her bright brown eyes, her endless energy and her contagious laugh. She was a competition squad cheerleader who loved to dance and express herself through a variety of different music. She loved to perform in plays in auditoriums full of onlookers or before a group of peers. She was also a beautiful artist. Erika used her creative hands to captivate the minds of art enthusiasts with canvas, paper, and clothing. Her artistic tendencies were even evident in the way in which she applied cosmetics, recalled her mother, Bette. On November 20, 2006, the car 16-year-old Erika was in collided with a fire truck. Despite tremendous efforts by firemen, emergency medical technicians, nurses and doctors, she died six days later. Her death gave four others a second chance at life through organ donation, and helped numerous others through tissue donation. Erika decided that she would donate her organs after she passed her driving test. “I remember vividly her exact first words when she walked confidently into the house after getting her driver’s license, ‘Look mom! I’m going to be an organ donor!’ After her accident, her father and I facilitated her wish. She was able to donate both of her kidneys, liver, pancreas, bone, tissue, and skin and heart valves,” said Bette. On January 1st, 2010, Erika will be honored and remembered in the 121st Rose Parade in Pasadena California. A picture of Erika’s face will be transformed into a floragraph; a portrait created with floral material and displayed on the Donate Life Rose Parade Float. (Above: Bette holding Erika's floragraph.) 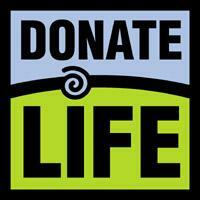 The Donate Life 2010 Float entry will feature 76 floragraphs of organ and tissue donors from across the country. The Donate Life Float themed “New Life Rises”, is represented by the mythical phoenix, a symbol of life emerging from the ashes of death. Prior to the parade, I will have the opportunity to decorate this inspirational float. My family will attend the Donate Life Gala Dinner, and sit in the grandstand seating to watch the Rose Bowl Parade. I can also tell you, personally, that the parade is nothing compared to the emotion of celebrating the holidays with your family – being alive, and hugging and laughing and singing with them – when in the not-too-distant past, you didn’t know whether you were going to survive to the next holiday; and knowing that there is a person, and a family out there somewhere, who are directly responsible for you being alive, and hugging and laughing and singing. This year, I had the most amazing New Year’s that I’ve had in my life. I got to ride the Donate Life Float in the Rose Parade carrying Kari’s picture. On New Year's Day, 2010, Anne Gulotta will have that experience carrying Jay’s picture. I’m sure that, over the next few months I’ll be posting about her upcoming journey – and I’ll be posting about her ride. This year, Annie will be placing my roses – and certainly roses for many other friends along with the rose she places for Jay. Each rose is placed in a vial that carries a unique, personal message of love, hope and remembrance. You too can place a rose to honor a donor, donor family, recipients or others touched by organ donation. For individuals, there are five packages ranging from as little as $25. All packages include a rose with the name of your loved one or honoree and an optional dedication of up to 200 characters. (Yes, I had a lot of trouble with that limitation!) The rose will be placed on the float in the Family Circle Garden. Your rose – dedicated to someone you love – will be on a float seen by a million people in Pasadena, and tens of millions on TV on New Year’s Day… Ain’t that a cool thought? Subsequent packages are priced between $50 and $250 and include a variety of things such as certificates, replicas of your dedication on the rose vial placed in the Family Circle Garden, pin sets and parade souvenir programs.